One of the things you may have learned about me from reading my articles in recent months is that I am a Chrome user. Iâ€™m a big fan of how fast and clean Google Chrome is, and it has only continued to impress me since I made the switch from Firefox. In the last few months I showed you how to browse privately in Chrome without going fully incognito. I also showed you what Google Chrome Instant is and why itâ€™s badass. 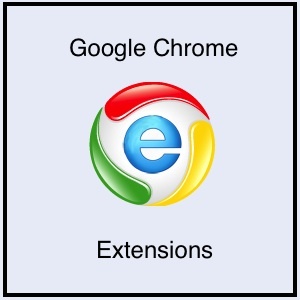 Today, weâ€™re talking Chrome extensions. I recently uncovered a few extensions that I have found to be very useful, and Iâ€™d like to share them with you. One lets you browse in split screen mode, which Iâ€™ve constantly had a need for, and one lets you browse â€˜up one levelâ€™ on websites. The third extension lets you run IE inside of Chrome, which is huge if you want to test the compatibility or formatting of something. I really like Chromeâ€™s tab feature, but sometimes I need to refer to two windows at the same time when Iâ€™m recording/comparing data orâ€“better yetâ€“multitasking. Split Screen is a simple extension that lets you view two websites at the same time, side by side, without having to resize your windows. Split Screen installs as a button next to the OmniBar. When you click on it, a new tab will open and youâ€™ll be prompted for two URLs. Type in your destinations and two websites will load in the same window. The URL bars cannot be used for searching in Google but the extension does come equipped with a notepad that saves whatever you type for the next time you use the extension, which can be great if you need to take notes. Typically, whenever you want to go back to a previous page you were on, you hit your browserâ€™s â€˜backâ€™ button. What browsers donâ€™t have, however, is a â€˜level upâ€™ button, which lets you return to a previous level of a website. If you install NavigUp, you will see a button in the Chrome OmniBar thatâ€“when clickedâ€“will take you up one level in the URL. For instance, if youâ€™re currently browsinghttp://www.daily-tips.net and you want to go up one level, just click the NavigUp button to be taken to http://www.daily-tips.net and once more to be taken to http://www.daily-tips.neteven if you hadnâ€™t browsed either of those URLs previously. Lots of people out there still use IE as their default browser, which means if youâ€™re designing or building something for the web you need to take IEâ€™s functionality into account. Chrome IE installs as a button next to the OmniBar that lets you toggle between Chrome and IE mode. To search or open pages in IE from the OmniBar, type IE and enter keywords or the URL. The Chrome extension also lets you sign in to different Google accounts in each browser. In conclusion, I am still an avid Chrome user. Being able to view two websites at once in a single window is pretty great, and NavigUp proved extremely useful as well. Admittedly I wonâ€™t have much of a need for the Chrome IE extension, but I know a lot of others who will be uninstalling IE from their computers after hearing about this extension. Are you one of them?